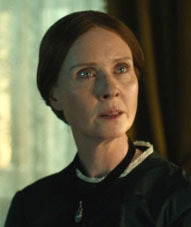 Cynthia Nixon. Jennifer Ehle. Keith Carradine. Emma Bell. Duncan Duff . Recommended. Women on Film. Hearing Impaired (DVD). Biopic. Historical. Comedy. 19th Century. Drama. A beautiful, witty depiction of a fantastic female poet. Terence Davies gives Dickinson the treatment she deserves, exploring how her personal life and character burst onto the page in the form of beautiful, lyric poetry. Wonderfully portrayed by Cynthia Nixon with a stellar supporting cast, it's a pure joy to watch.